Lake Mound Cemetery is located on the southeast corner of Sheridan Road and 29th Street in Zion. It covers 1.5 acres adjacent to the north property line of the Memorial Methodist Church. For more than 140 years, the cemetery was managed by the Lake Mound Cemetery Association which was founded in 1861 by the members of the East Benton Methodist Episcopal Church. The area now known as Zion was originally called Dickertown. The original Methodist Church was located on the west side of Sand Ridge Road (now Sheridan Road) near 33rd Street. One half mile south of the original church was a burial ground in what is now the southwest corner of Sheridan Road and Wadsworth Road. The burial ground was on the south bank of the ravine. When a wooden bridge which spanned the ravine was removed and a cement culvert was put in on Sheridan Road, the earth on this hill was used for fill and every indication that the spot was once a cemetery disappeared. It is probable that the only remains that were moved to the new cemetery were those of brothers George and I.G. Braden who both died in 1855. Their remains now lie in Lake Mound. The original Methodist Church burned and a new church was erected on the east side of Sheridan Road at 30th Street, just south of the current location of Lake Mound Cemetery. It is believed that the first burial in Lake Mound Cemetery was in 1861, being that of James Cole. Nelson Landon, the first settler in Benton, and one of the first Commissioners of Lake County when it was organized, is also buried in Lake Mound. Reverend John Alexander Dowie, founder of Zion, and his wife and two children are buried there. Interestingly, Reverend Dowie and his wife, Jane, were both raid to rest on the same day, March 14, John in 1907 and Jane in 1933. Robert Baird, son of a pioneer family and a Professor of Greek at Northwestern University for 35 years, is also buried there. Lake Mound is the resting place of veterans of four of the nation’s wars. When Zion City was established in 1900, the Methodist Church deeded the land that is now Lake Mound Cemetery to Zion. Mr. Clark Corser, who is buried in the cemetery, was a great help to Founder John Alexander Dowie in organizing deeds and titles to the land. The original records for Lake Mound were destroyed in a fire in the early 1930’s. The two records were reconstructed by viewing the grave markers and contacting families who owned grave lots. 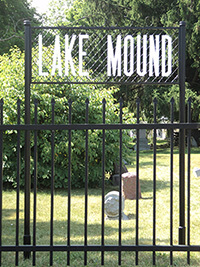 In 1937, the Lake Mound Cemetery Association passed a resolution to place the cash and securities held by the Association in perpetual trust for the purpose of securing a perpetual income to be used for the perpetual and permanent repair, improvement, maintenance, care, preservation and ornamentation of the Lake Mound Cemetery. In 2005, the Lake Mound Cemetery Association transferred ownership of the Lake Mound Cemetery to the City of Zion to be operated as a licensed municipal cemetery. The cemetery is currently managed by the Lake Mound Cemetery Board with three members being appointed to two-year terms by the Mayor. The cemetery trust is overseen by the City’s Director of Accounts and Finance. 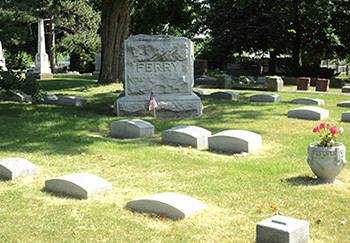 Cemetery maps and records are maintained by the City Clerk. The cemetery grounds are maintained by the City of Zion Public Service Department. Two (2) plots are currently available for sale through a private owner. For more information, please contact the City Clerk at 847-746-4014.